There are more information channels now than ever. These include thousands of new TV and radio channels that are enabled by the internet, millions of YouTube videos, new electronic book and magazine platforms such as tablets and mobile devices, talking books, easy print-on-demand, 3D printing, holograms, games platforms, interactive books, augmented reality and even AI chatbots, all in parallel with blogs, websites and social media such as Facebook, Linked-In, Twitter, Pinterest, Tumblr and so on. It has never been easier to publish something. It no longer has to cost money, and many avenues can even be anonymous so it needn’t even cost reputation if you publish something you shouldn’t. In terms of means and opportunity, there is plenty of both. Motive is built into human nature. People want to talk, to write, to create, to be looked at, to be listened to. That doesn’t guarantee fame and fortune. Tens of millions of electronic books are written by software every year – mostly just themed copy and paste collections using content found online – so that already makes it hard for a book to be seen, even before you consider the millions of other human authors. There are hundreds of times more new books every year now than when we all had to go via ‘proper publishers’. The limiting factor is attention. There are only so many eyeballs, they only have a certain amount of available time each day and they are very spoiled for choice. Sure, we’re making more people, but population has doubled in 30 years, whereas published material volume doubles every few months. That means ever more competition for the attention of those eyeballs. When there is a glut of material available for consumption, potential viewers must somehow decide what to look at to make the most of their own time. Conventional publishing had that sorted very well. Publishers only published things they knew they could sell, and made sure the work was done to a high quality – something it is all too easy to skip when self-publishing – and devoted the largest marketing budgets at those products that had the greatest potential. That was mostly determined by how well known the author was and how well liked their work. So when you walked through a bookshop door, you are immediately faced with the books most people want. New authors took years of effort to get to those places, and most never did. Now, it is harder still. Self-publishing authors can hit the big time, but it is very hard to do so, and very few make it. Selling isn’t the only motivation for writing. Writing helps me formulate ideas, flesh them out, debug them, and tidy them up into cohesive arguments or insights. It helps me maintain a supply of fresh and original content that I need to stay in business. I write even when I have no intention of publishing and a large fraction of my writing stays as drafts, never published, having served its purpose during the act of writing. (Even so, when I do bother to write a book, it is still very nice if someone wants to buy it). It is also fun to write, and rewarding to see a finished piece appear. My sci-fi novel Space Anchor was written entirely for the joy of writing. I had a fantastic month writing it. I started on 3 July and published on 29th. I woke every night with ideas for the next day and couldn’t wait to get up and start typing. 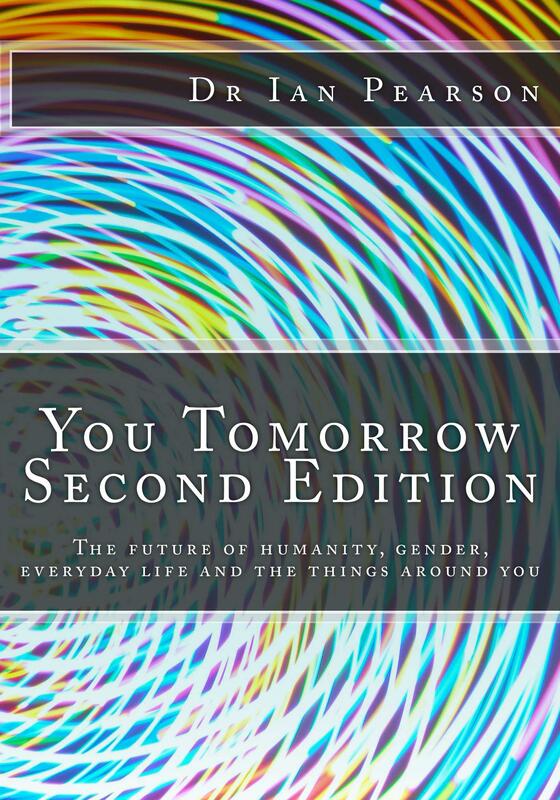 When I ran out of ideas, I typed its final paragraphs, lightly edited it and published. The future of writing looks even more fun. Artificial intelligence is nowhere near the level yet where you can explain an idea to a computer in ordinary conversation and tell it to get on with it, but it will be one day, fairly soon. Interactive writing using AI to do the work will be very reward-rich, creativity-rich, a highly worthwhile experience in itself regardless of any market. Today, it takes forever to write and tidy up a piece. If AI does most of that, you could concentrate on the ideas and story, the fun bits. AI could also make suggestions to make your work better. We could all write fantastic novels. With better AI, it could even make a film based on your ideas. We could all write sci-fi films to rival the best blockbusters of today. But when there are a billion fantastic films to watch, the same attention problem applies. If nobody is going to see your work because of simple statistics, then that is only a problem if your motivation is to be seen or to sell. If you are doing it for your own pleasure, then it could be just as rewarding, maybe even more so. A lot of works would be produced simply for pleasure, but that still dilutes the marketplace for those hoping to sell. An AI could just write all by itself and cut you out of the loop completely. It could see what topics are currently fashionable and instantaneously make works to tap that market. Given the volume of computer-produced books we already have, adding high level AI could fill the idea space in a genre very quickly. A book or film would compete against huge numbers of others catering to similar taste, many of which are free. AI also extends the market for cooperative works. Groups of people could collaborate with AI doing all the boring admin and organisation as well as production and value add. The same conversational interface would work just as well for software or app or website production, or setting up a company. Groups of friends could formulate ideas together, and produce works for their own consumption. Books or films that are made together are shared experiences and help bind the group together, giving them shared stories that each has contributed to. Such future publication could therefore be part of socialization, a tribal glue, tribal identity. This future glut of content doesn’t mean we won’t still have best sellers. As the market supply expands towards infinity, the attention problem means that people will be even more drawn to proven content suppliers. Brands become more important. Production values and editorial approach become more important. People who really understand a market sector and have established a strong presence in it will do even better as the market expands, because customers will seek out trusted suppliers. So the future publishing market may be a vast sea of high quality content, attached to even bigger oceans of low quality content. In that world of virtually infinite supply, the few islands where people can feel on familiar ground and have easy access to a known and trusted quality product will become strong attractors. Supply and demand equations normally show decreasing price as supply rises, but I suspect that starts to reverse once supply passes a critical point. Faced with an infinite supply of cheap products, people will actually pay more to narrow the choice. In that world, self-publishing will primarily be self-motivated, for fun or self-actualization with only a few star authors making serious money from it. Professional publishing will still have most of the best channels with the most reliable content and the most customers and it will still be big business. Finally. Z. Zero, zoos, zebras, zip codes. Zip codes is the easiest one since I can use someone else’s work and just add a couple of notes. This piece for the Spectator was already written by Rory Sutherland and fits the bill perfectly so I will just link to it: http://www.spectator.co.uk/life/the-wiki-man/9348462/the-best-navigation-idea-ive-seen-since-the-tube-map/. It is about http://what3words.com/. Visit the site yourself, find out what words describe precisely where you are. The idea in a nutshell is that there are so many words that combining three words is enough to give a unique address to every 3×3 metre square on the planet. Zip codes, or post codes to us brits, don’t do that nearly so well, so I really like this idea. I am currently sitting at stem.trees.wage. (I just noticed that the relevant google satellite image is about 2006, why so old?). It would allow a geographic web too, allowing you to send messages to geographic locations easily. I could send an email to orbit.escape.given.coffeemachine to make a cup of coffee. The 4th word is needed because a kettle, microwave and fridge also share that same square. The fatal flaw that ruins so many IoT ideas though is that I still have to go there to put a cup under the nozzle and to collect it once it’s full. Another one is that with that degree of precision, now that I’ve published the info, ISIS now has the coordinates to hit me right on the head (or my coffee machine). I think they probably have higher priorities though. Warning: rant, no futures insights enclosed. Last night, we went for a very pleasant meal with friends. The restaurant was in a lovely location, the service was excellent, the food was excellent. The only irritating thing was a pesky fly. However, for some reason, the menu was written on nice paper in 6 point text with about 15mm line spacing. Each line went about 2/3 of the way across the page. I hadn’t brought my reading glasses so was forced to read small text at arm’s length where it was still blurred. My poor vision is not the restaurant’s fault. But I do have to ask why there is such a desire across seemingly every organisation now to print everything possible with the tiniest font they can manage? Even when there is lots of space available, fonts are typically tiny. Serial numbers are the worst culprits. My desktop PC is normal tower size and has its serial number printed on a tiny label in 1mm font. Why? Even my hated dishwasher uses a 2mm font size and that stretches my vision to its limits. Yes, I am ageing, but that isn’t a crime. When I was a school-kid, I took great pride in irritating my teachers by writing with the finest tipped ball-pen I could get (Bic extra-fine) in the smallest writing I could manage. I rarely submitted a homework without getting some comment back on my writing size. But then I grew up. It makes me wonder whether increased printer capability is a problem rather than an asset. Yes, you can now print at 2000 dpi or more, and a character only needs a small grid so you can print small enough that a magnifying glass is needed for anyone to be able to read the text. But being physically able to print that small doesn’t actually make it compulsory. So why does it make it irresistible to many people? When I do conference presentations, if I use text at all, I make sure it is at least 16pt, preferably bigger. If it won’t fit, I re-do the wording until it does. Some conferences that employ ‘designers’ come up with slide designs that contain a massive conference logo, bars on the side and bottom, title half way down the page, and any actual material has to be shrunk to fit in a small region of the slide with eye-straining font sizes on any key data. I generally refuse to comply when a conference employs such an idiot, but they are breeding fast. If someone can’t easily read text from the back row, it is too small. It isn’t actually the pinnacle of cool design to make it illegible. Mobiles have small displays and small type is sometimes unavoidable, but even so, why design a wireless access login page with a minuscule login box that takes up a tiny fraction of the page? If there is nothing else on the page of any consequence apart from that login details box, why not fill the display with it? Why make it a millimetre high, and have loads of empty space and some branding crap, so that a user has to spend ages stretching it to make it the important bit usable? What is the point? To me, good design isn’t about making something that is pretty, that can eventually be used after a great deal of effort. It is about making something that does the job perfectly and simply and is pretty. A good designer can achieve form, simplicity of use and function. Only poor designers have to pick one and ignore the others. The current trend to make text smaller and smaller is pointless and counter-productive. It will cause eye problems for younger people later in their lives. It certainly discriminates against a large proportion of the population that needs glasses. Worse, it does so without no clear benefit. Reading tiny text isn’t especially pleasurable compared to larger text. It reduces quality of life for many without increasing it for anyone else. It is time to end this stupid trend and send designers back to school if they are somehow convinced that illegibility is some sort of artistic goal. The primary purpose of text is to communicate. If people can’t easily read the text on your design, the communication is impeded, and your design is therefore crap. If you think you know better, and that tiny text is more attractive and that is what really counts, you should go back to school. Or find a better school and go to that one. Thinking of starting a blog but not sure if it’s worth it? It is. Yes. Blogging is easy and fun and definitely worth it. I started my wordpress blog just over three years ago. I have put out 160 posts and had 60,000 readers, 375 per post. Pathetic if you compare to the top blogs, but comparing yourself to others is the fast way to misery, so don’t. I look at the world on my terms, with my limits and my ability, not that of others. Some do better, some worse, so what? I’m me, not them. In influence terms, with my readership level, it is probably equivalent to doing a talk on that topic to a conference of 375 people, (which is a big part of my business). But blogging is a lot easier, much faster if you include prep and travel time, and less stressful. Blogging is unpaid work, but it costs in in other ways. It helps me to think an idea through, and to refresh and update old ideas. Occasionally, comments by readers point out errors and omissions too. It therefore helps make my other consultancy and talks fresh and weed out errors in my thinking, keeping customers happy. Happy customers generate more happy customers. So although it is unpaid directly, it probably significantly generates and maintains revenue indirectly. And of course it is a sort of advertising. There are numerous other paybacks that are hard to quantify but which certainly add justification. It’s a way of recording an idea so you can point to it later and say “I told you so” or “I said that first”. A way of teasing friends or colleagues, generating responses and discussion or occasionally just having a good rant. It can be entertainment, education or thought stimulation for readers, or maybe just a piece that readers can empathise with and share an experience. But mostly, blogging is about being part of the bigger community, being part of a huge discussion panel, social networking, making some input and feeling satisfaction if you occasionally write something you can be proud of. If you write a blog, none of this is news to you. If you don’t, I’d encourage you to have a go. It is easy to get started, especially on wordpress, and free, unless you want to pay for deluxe facilities. Just go to the wordpress.com page, click a few obvious buttons to create a free account, fill in some simple data and you’re flying. Half an hour to your first post. There are loads of page designs to pick from that you can personalise, most are free. You can buy premium upgrades of course, but they are entirely optional. Go on. You know you have something to say or share that other people will be interested in. I had a new idea. If I was adventurous or an entrepreneur, I’d develop it, but I’m not, so I won’t. But you can, before Apple patents it. Or maybe they already have. Many people own various brands of pads, but they are generally expensive, heavy, fragile and need far too much charging. That’s because they try to be high powered computers. Even e-book readers have too much functionality for some display purposes and that creates extra expense. I believe there is a large market for more casual displays that are cheap enough to throw around at all sorts of tasks that don’t need anything other than the ability to change and hold a display. 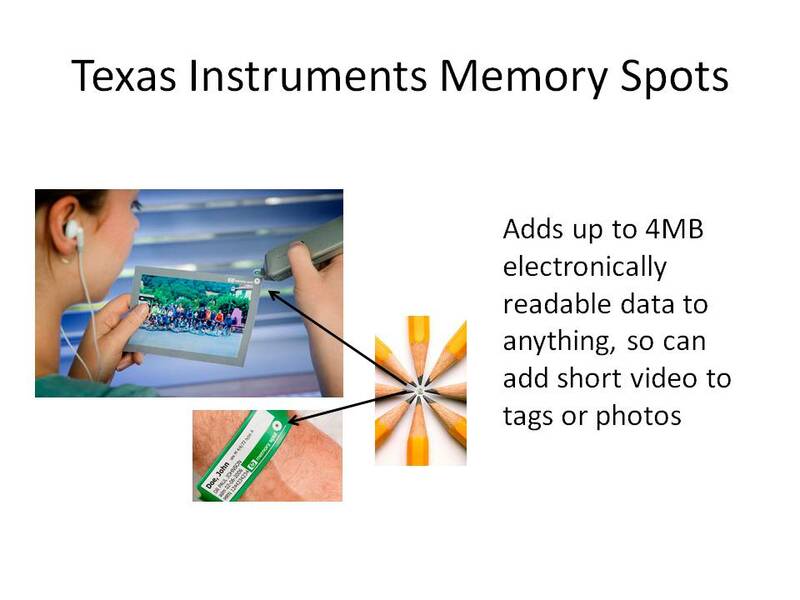 Several years ago, Texas Instruments invented memory spots, that let people add multimedia to everyday objects. The spots could hold a short video for example, and be stuck on any everyday object. These were a good idea, but one of very many good ideas competing for attention by development engineers. Other companies have also had similar ideas. However, turning the idea around, spots like this could be used to hold data for a display, and could be programmed by a similar pen-like device or even a finger touch. Up to 2Mb/s can be transmitted through the skin surface. 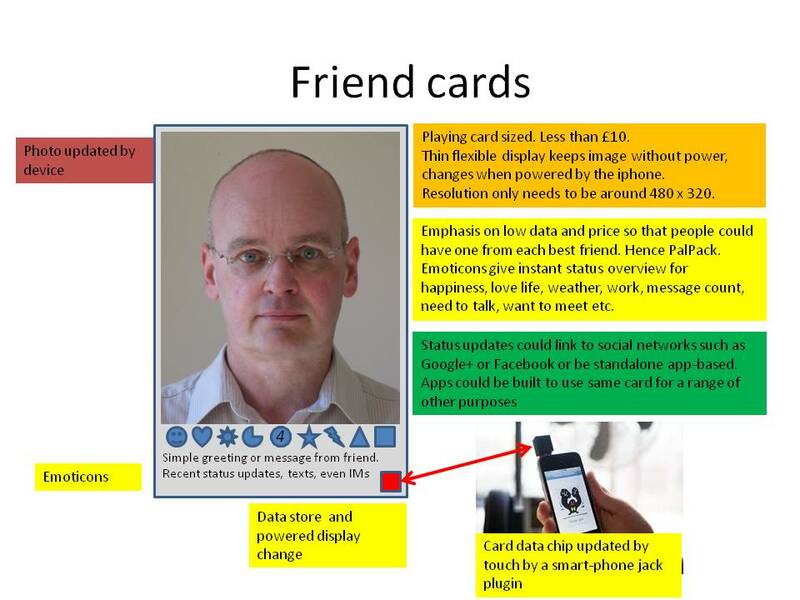 Friend cards could act as a pin-board reminder of a friend, or sit in a wallet or handbag. You might have one for each of several best friends. A touch of the spot would update the card with the latest photo or status from Facebook or another social site. Or it could be done via a smart phone jack. But since the card only has simple functionality it would stay cheap. It does nothing that can’t also be done by a smartphone or pad, but the point is that it doesn’t have to. It is always the friend card. The image would stay. It doesn’t need anything to be clicked or charged up. It only needs power momentarily to change the picture. There are displays that can hold pictures without power that are postcard sized, for less than £10. Adding a simple data storage chip and drivers shouldn’t add significantly to cost. So this idea should be perfectly feasible. 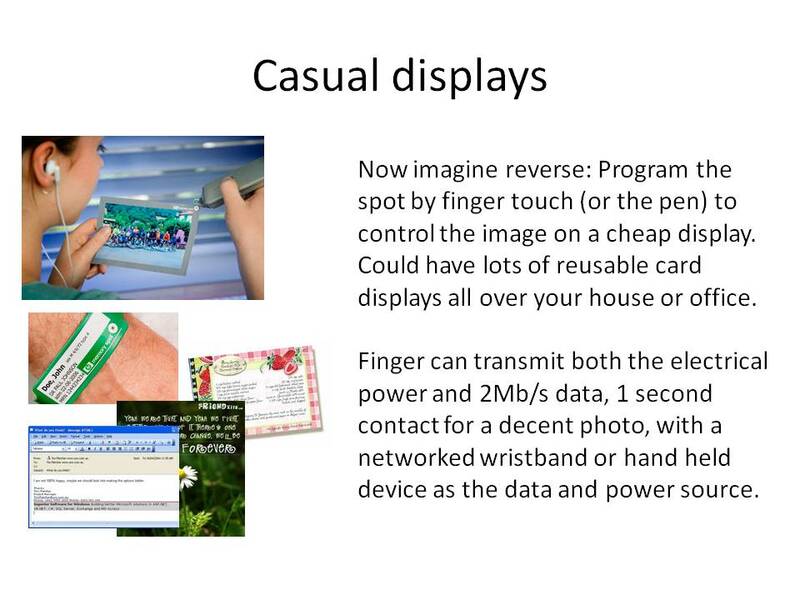 We should be able to have lots of casual displays all over our houses and offices if they don’t have to do numerous other things. In the case of displays, less may mean more. http://www.telegraph.co.uk/technology/news/9236667/Pirate-Bay-must-be-blocked-High-Court-tells-ISPs.html Justice Arnold ruled that ISPs must block their customers from accessing Pirate Bay. Regardless of the morality or legality of Pirate Bay, forcing ISPs to block access to it will cause them inconvenience and costs, but won’t fix the core problem of copyright materials being exchanged without permission from the owners. I have never looked at the Pirate Bay site, but I am aware of what it offers. It doesn’t host material, but allows its users to download from each other. By blocking access to the Bay, the judge blocks another one of billions of ways to exchange data. Many others exist and it is very easy to set up new ones, so trying to deal with them one by one seems rather pointless. Pirate Bay’s users will simply use alternatives. If they were to block all current file sharing sites, others would spring up to replace them, and if need be, with technological variations that set them outside of any new legislation. At best judges could play a poor catch-up game in an eternal war between global creativity and the law. Because that is what this is. Pirate Bay can only be blocked because it is possible to identify it and put it in court. It is possible to write software that doesn’t need a central site, or indeed any legally identifiable substance. It could for example be open-source software written and maintained by evolving adaptive AI, hidden behind anonymity, distributed algorithms and encryption walls, roaming freely among web servers and PCs, never stopping anywhere. It could be untraceable. It could use combinations of mobile or fixed phone nets, the internet, direct gadget-gadget comms and even use codes on other platforms such as newspapers. Such a system would be dangerous to build from a number of perspectives, but may be forced by actions to close alternatives. If people feel angered by arrogance and greed, they may be pushed down this development road. The only way to fully stop such a system would be to stop communication. The simple fact is that technology that we depend on for most aspects of our lives also makes it possible to swap files, and to do so secretly as needed. We could switch it off, but our economy and society would collapse. To pretend otherwise is folly. Companies that feel abused should recognise that the world has moved on and they need to adapt their businesses to survive in the world today, not ask everyone to move back to the world of yesterday so that they can cope. Because we can’t and shouldn’t even waste time trying to. My copyright material gets stolen frequently. So what? I just write more. That model works fine for me. It ain’t broke, and trying to fix it without understanding how stuff works won’t protect anyone and will only make it worse for all of us. Twitter are the latest in a line of surrenders to authority in the last few years. The web started off nicely and grew in importance and everyone talked of how governments couldn’t censor it, and it would always bypass them. It was the new land of the free. But underneath, we all knew that wouldn’t last forever and governments would use their real world power to force web companies into submission. Actually, the surrenders seem rather spineless to me, and were unnecessary, but I guess the web has become a standard ordinary everyday business platform and the companies behave just like any other business now. The brave explorers pushing out in pursuit of the frontiers have gone, replaced by MBAs. Napster was the first biggy, forced to stop music sharing on the free and to become a proper commercial front end for the music industry. Then Google surrendered its ‘Do no evil’ principle to commercialism, first in China, now globally. It has since become a Big Brother in its own right, collecting deep data not only for its own megalomania but also for any government department that can make ‘a valid legal claim’ (extracted from their new rules on privacy). I have no real choice but to carry on using their mail and search, and I still like Google in spite of their abuses – no one’s perfect – though I am extremely wary of using Google+ seriously. I barely access my account, just like Facebook, and for the same reasons. Facebook and Apple also both became Big Brothers, collecting far more date than most people realised, wanting their own high-walled garden dictatorships. They have them now, but I keep my distance and only visit them as much as I need to. After a few years of ongoing high-profile collapses and surrenders of principle, now Twitter has surrendered too. So now the web is under government control, pretty much everywhere, and worse still, with a layer of big corporate control underneath. Companies on the web have to do as they are told, follow the rules. But they also impose their own too. It is the worst nightmare for those of us who used to debate whether big companies or governments would end up controlling us, which would have the power? We ended up with the worst of both worlds. Many would argue that that is what should be. Why should the web have different rules? All companies should obey the law. I’d agree to a point, but I’d agree a whole lot more if we lived in a world with good leaders of properly democratic governments taking us forwards to a life of freedom and health and prosperity for all. What I see instead is a global flock of very poor leaders, a sad combination of the greedy, the corrupt and the stupid, with increasing oppression, increasing polarisation, grabbing what they can for themselves in a less fair world, and more attempts to control our thoughts. So I tend to lean towards wanting a new kind of web, one that governments can’t control so easily, where freedom of speech and freedom of thought can be maintained. If a full surveillance world prevents us from speaking, then we need to make another platform on which we can speak freely. I’ve written a number of times about jewellery nets and sponge nets. These could do the trick. With very short-range communication directly between tiny devices that each of us wears just like jewellery, a sponge network can be built that provides zillions of paths from A to B, hopping from device to device till it gets there. A sponge net doesn’t need any ISPs. (In fact, I’ve never really understood why the web needs them either, it is perfectly possible to build a web without them). Each device is autonomous. Each shares data with its immediate neighbours, and route dynamically according to a range of algorithms available to them. They can route data from A to B so that every packet goes by a different route of need be. Even without any encryption, only A and B can see the full message. The various databases that the web uses to tell packets where their destination is can be distributed. There is a performance price, but so what? You could even route geographically. Knowing the precise geographic location of your recipient, packets can simply use a map or GPS to get there. I’m not aware of any GPS based nets yet, but you could easily build one. I quite like the idea personally. Self organisation is an easy way of linking processing and storage and sensory capability into massively capable platforms. This is useful in its own right but also enables better file sharing or free speech with reasonable performance. It would be easy to bypass any monitoring if it is detected. Even if it is only suspected, the massively divergent routing that sponges enable would make monitoring extremely hard to do. 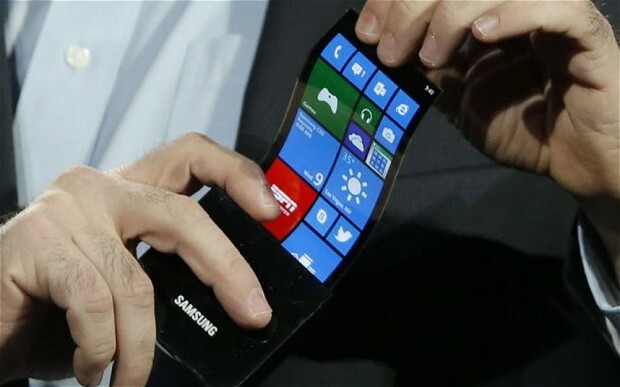 The capability to make these kinds of devices is almost here. Given the world that we live in, governments might try hard to prevent them from existing. But there are so many benign reasons to do so that it might be hard for them to resist the pressure. Almost all of the spirit of the early web was aimed at making the world a better place. Sure a few criminals and terrorists got in on the act, but the balance was for good. We lost it, and are worse off for it. Letting it happen again would be good for everyone. Sponge nets can do that. If some government officials don’t like it, well, so what? Right now, I don’t have a lot of respect for government.